I will be honest when I say that Snow White by Enchanted Productions at Tyne Theatre & Opera House was not one of our favourite pantos last Christmas. It seemed too scripted, polished and predictable to me and lacked the 'banter' I have come to expect from a Geordie panto. There weren't any real wow factors and although it was a good all-rounder, I left thinking they'd need to do better this year to keep tickets sales up - after all, there's A LOT of choice when it comes to panto in the North East now. 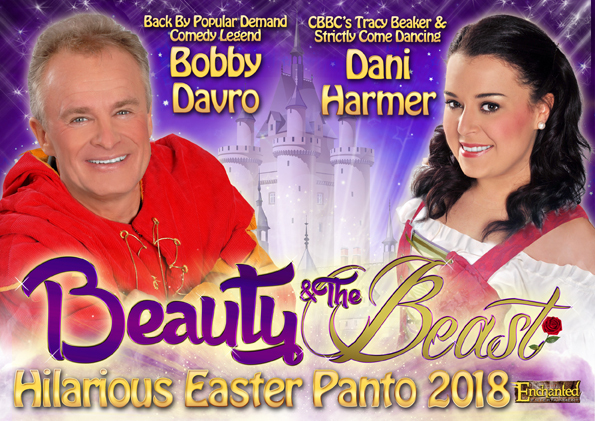 So when we were invited along to their Easter panto - Beauty and the Beast starring Bobby Davro and Dani Harmer (aka Tracy Beaker), we decided to give Enchanted Entertainment a second chance. Steve and I both remember watching Bobby Davro in panto as a child ourselves and thought it could be a good laugh. Easter weekend has been a huge wash-out here in the North East and a trip to the theatre was a good excuse to get out of the house and something we were looking forward to after having to cancel an egg hunt earlier in the day. We parked in the Grainger Town multi-story car park which is a short walk from Tyne Theatre and free after 5pm. We were a little early so stopped for a drink in the theatre's bar before curtain up. The drinks are always reasonably priced here (£8 for our round including 2 alcoholic drinks). The audience was a mix of families and couples plus older groups too - it was a real mix and I'd say there were actually less kids in the audience than expected. I'm pleased to report that our first Easter panto was a real triumph and it seems as if Enchanted Entertainment have learned from their errors at Christmas. The whole panto was a lot more relaxed and every single element was perfect for us. We all left saying it was one of the best pantos we've watched in recent years. It could have been down to the fact that there's less pressure on an Easter panto but we thought Bobby Davro as Silly Billy was hilarious and the real star of the show. With loads of audience interaction (including an epic Jaffa Cake challenge), lots and lots of laughs ranging from classic jokes to those were bang up to date plus plenty of off-script banter which for me is what makes a panto, you can really see Bobby Davro's experience shining through when he's on stage and he's a real pro that handles the crowd with ease. He even managed to get us Geordies up dancing twice throughout the show. The laughter reached its peak during a double act with 'Anton-du-Burke' with an 'impression-off' that was absolutely spot-on - it was fantastic being able to watch such talent on stage. The supporting cast was really good too with the good fairy providing light-hearted fun, the bad guy Anton really got the crowd on side and we had fun booing as he appeared on stage whilst also laughing along as he slipped out of his French accent. Beauty and the Beast were both very fantastic too. I adored a rather special scene between the two of them that was inspired by The Greatest Showman - it was beautiful. Beauty and the Beast was a proper 80s panto that had the kids in the audience dancing in the aisles by the end of the show, just like I remembered as a child and we all absolutely loved it. The whole family spent most of the show laughing out loud. It was fast-moving with lots of well-known songs and plenty of laughs and 'did he really just say that' moments. There are still tickets available for Easter Sunday available for a 1pm and 5pm performance. If you're looking for some indoor Easter Sunday fun for the whole family, I'd recommend grabbing some last minute tickets. I would love to see Bobby Davro return next year for another panto and if he does, I'll be the first in line for tickets. Buy online and find out more here.